In recent weeks, I’ve been sharing some of the fuller versions of interviews conducted while I was researching and writing A More Beautiful Question. Here are some quotes from my talk with Joichi Ito (@Joi), one of the world’s most respected technologists and the current director of that hothouse of innovation known as the MIT Media Lab. “If the learner is doing the questioning, it’s very different from when an examiner (or teacher) is doing the questioning. When you have the examiner doing the questioning, you’re in what I would call education mode. 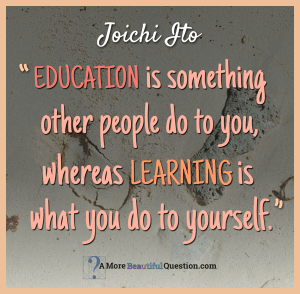 I think education is something other people do to you, whereas learning is what you do to yourself. You don’t learn unless you question—but we often don’t teach our kids to question; we teach them to answer our questions, forcing them to learn facts and skills. But since we may not know what facts or skills that kid’s going to need in the future, what you really want is to empower them to be able to find their own answers when they need them. “If a group is asking a question or challenging itself to come up with an answer for something, there’s a great body of work that shows diversity is extremely important. Everybody has different frameworks or models to ask the question; and it turns out that having a large number of very smart people that are similar is not nearly as useful as having maybe less smart people but with diversity of background. “Then the issue becomes, how do you have a constructive conversation when everyone’s frameworks and backgrounds are different? At the Media Lab, we do what I call practice over theory. So, if an artist and a mechanical engineer are working together, it might be difficult for them to write a rigorous academic paper together, but they can build something together… and it either works or doesn’t. Often, academics create theories and test them and if it doesn’t work they start questioning the reality, the data. We’re the opposite; we build a robot and if it doesn’t work, it doesn’t work. And if it works but we don’t understand it, we can study it. Being able to “build the robot” is a really essential in this kind of environment where you’re searching and trying to discover things.